In many ways, preparing for a phone interview can be just as difficult as a face-to-face meeting: you need to anticipate the types of questions you will be asked, review the position’s requirements, and research the company. The only thing you don’t have to worry about is what to wear. 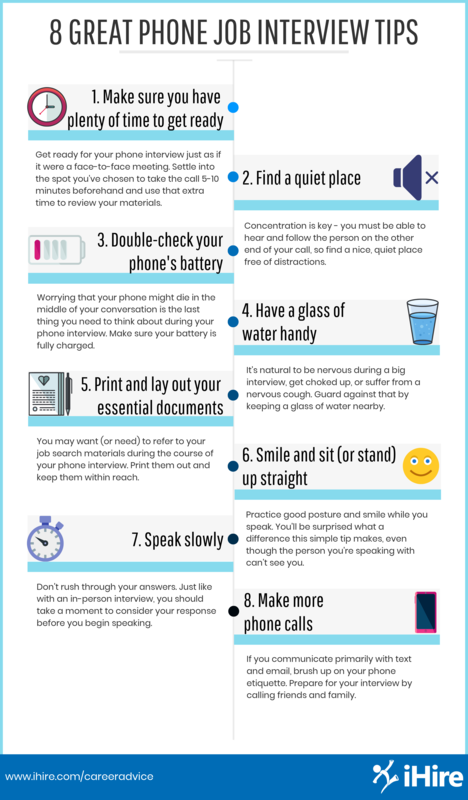 Phone interview advice and phone job interview tips can be found from many sources, so we compiled the best phone interview tips in a simple, easy-to-read infographic. Looking for a more in-depth phone interview guide? With iHire’s expert advice, we can help you make phone interviewing a breeze.